Ghanaians go to the polls on December 7th and the police is making sure the electorate turn up in their numbers to cast their votes. 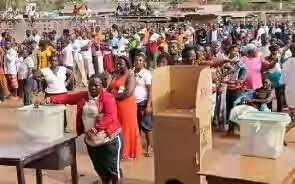 Police Superintendent Isaac Amekudzi of Agona Odobeng in the Asikuma Odobeng Brakwa District of the Central Region has revealed that persons who refuse to vote in the forthcoming general elections may be arrested. The officer said voting is a constitutional provision and those who don't turn up show disregard for the laws. He said it will be a waste of resources for the country to organise an election and the voters don't show up. “Voting is all about democracy and also one’s civic responsibility to vote during election. So on the day of elections if you are seen loitering around and not voting as required, the police may be compelled to enforce the law by arresting you”, he warned. “All Ghanaians should all vote because of democracy rather than fighting and drinking excessively on the day”, he urged. He enjoined citizens to come out en masse rather than spend the time in leisure and drinking. “On my part, I will also make sure that all the ‘wee’ joints and akpeteshi bars will be shut down during the Election day”, he disclosed.